007 MAGAZINE celebrates its 40TH birthday! 007 MAGAZINE, the world’s number one publication dedicated to the world of James Bond celebrates its 40th Anniversary in 2019. Since April 1, 1979, 007 MAGAZINE has faithfully chronicled, debated and celebrated Ian Fleming's enduring hero. 007 MAGAZINE is renowned for the consistent excellence of its journalism, the unparalleled variety of its photographic content and the encyclopaedic depth of its research and information. The seminal publication 007 MAGAZINE has long been recognised as an essential authoritative source for the most reliable and deeply researched editorial content on all aspects of the James Bond phenomenon. Coupled with exclusive images from the 007 MAGAZINE ARCHIVE, the world’s largest commercial archive related to James Bond, every issue of the luxury publication is packed with many rare and never-before-seen images. 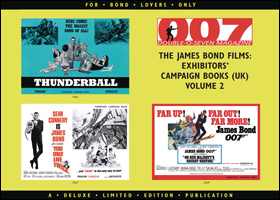 In the last four decades 007 MAGAZINE has featured interviews and contributions from just about every individual imaginable connected with James Bond, including Oscar-winning Dubbing Editor Norman Wanstall, Director Terence Young, actors Ursula Andress and Christopher Lee, while interviewees featured in 007 MAGAZINE over the last four decades have been an eclectic selection of key players in the James Bond legacy, and include James Bond actors George Lazenby, Roger Moore, Timothy Dalton, Pierce Brosnan, Daniel Craig; Moneypennys – Lois Maxwell, Pamela Salem, Samantha Bond; Bond Girls – Izabella Scorupco, Denise Richards, Eva Green, Bérénice Marlohe, Shirley Eaton, Martine Beswicke, Caroline Munro, Nadja Regin, Margaret Nolan – and the ‘voice of the Bond Girls’, Nikki van der Zyl; and from behind the camera – Directors Lewis Gilbert, John Glen, Michael Apted; Production Designers Syd Cain, Oscar-winners Ken Adam, and Peter Lamont; Composer David Arnold, Stunt Arranger Simon Crane; and from 007’s literary heritage – Bond authors Kingsley Amis (a.k.a. Robert Markham), John Pearson, and John Gardner. 007 MAGAZINE has premiered unique and ground-breaking events that have seen Bond film stars, crew alumni and iconic props reunited at James Bond's spiritual cinematic home Pinewood Studios for the first time since their filming days, and it has overseen the salvaging and restoring of some the most unique Bond props and vehicles ever to grace the silver screen. As 007 MAGAZINE goes from strength-to-strength, it looks set, with Graham Rye's unwavering hand on the tiller, to continue on the path of quality and excellence that has kept it for so long the undisputed premier publication of the James Bond phenomenon. GRAHAM RYE began publishing 007 MAGAZINE as a part-time venture before developing it into a full-time commercial enterprise, since when his publication has become ‘the bible’ for thousands of Bond fans in over 40 countries around the world. His interest in all things Bond began at the tender age of 11 when his father took him in 1962 to see the first James Bond film Dr. No. With the release of Goldfinger in 1964 he discovered Ian Fleming’s James Bond novels and was hooked – for life! Rye describes himself as a ‘traditionalist Bond fan’, and considers the first six films in the series to be the quintessential Bond: “If my home was on fire and I had time to grab a couple of handfuls of Bond Blu-rays as I dashed out, it would have to be Dr. No to On Her Majesty’s Secret Service – perhaps Diamonds Are Forever – but only if it was a small fire!” Rye is also the author of the best-selling book The James Bond Girls.